My back seems to be healing. I completed two weeks of daily traction therapy each evening and it seems to have taken the pressure off of the nerve. It has allowed me to be fairly active for the past week which has been a blessing. Please continue to pray for a complete healing without surgery. We meet with the neurosurgeon tomorrow evening to get his assessment of the situation. 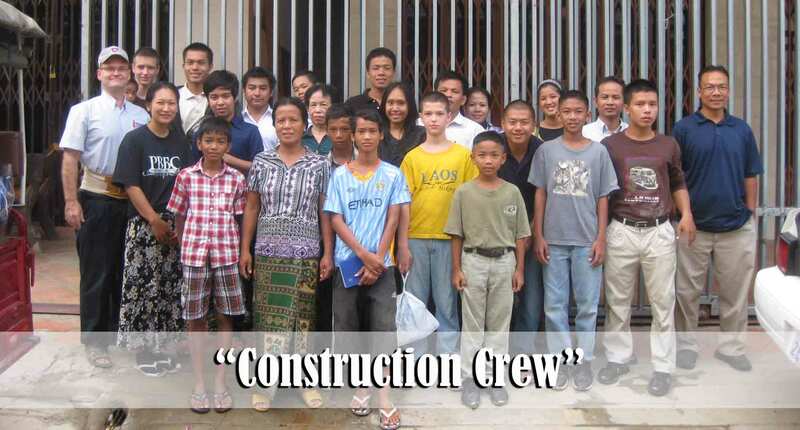 This past Monday about 25 of the folks from Phnom Penh traveled to the village to help construct the new church building. Some of them took off work in order to help. We met up with another 15 folks from the village who spent the entire day helping dig the ground and erect the pillars. 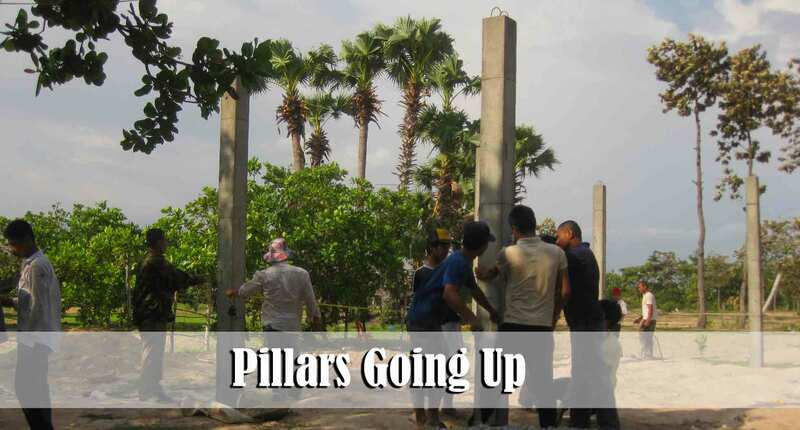 We have the 8 pillars erected and, Lord willing, the roof will be installed at the end of this week. So far we are planning for the floor to be dirt. If there is money left over we will lay cement. One of our members, Chayry, and his wife Ge own land in the village and are very happy to allow the church to be built on their land. 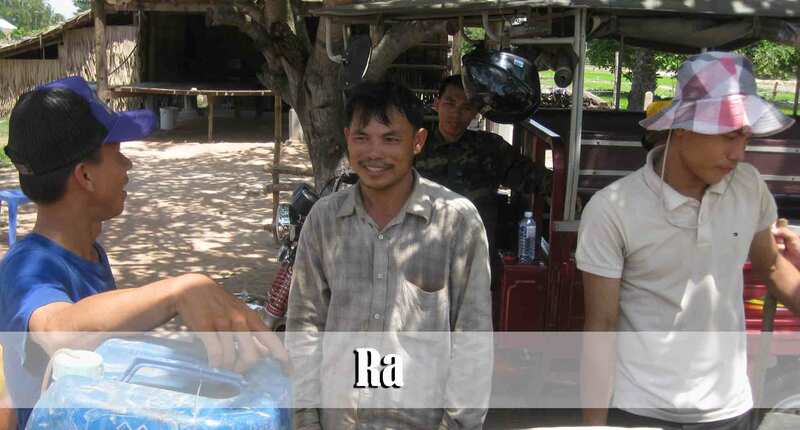 He is a soldier in the Cambodian army in charge of logging logistics. His special computer skills necessitate him being sent to various places in the country where he is needed. He is often gone for a couple of weeks at a time or longer. He has had struggles in the past but in recent months has been spiritually stable. He is working hard to start a business raising chickens. His goal is to be able to earn enough money from that business that he will be able to support his family without being a soldier. Once he has enough income from selling chickens he will request that the military allow him to resign. His goal is to be able to be home with his family and to increase the amount of time that he is able to devote to ministry. I remember leading him to Christ 6 years ago and it has been a blessing to see the steps of spiritual growth that he has taken. 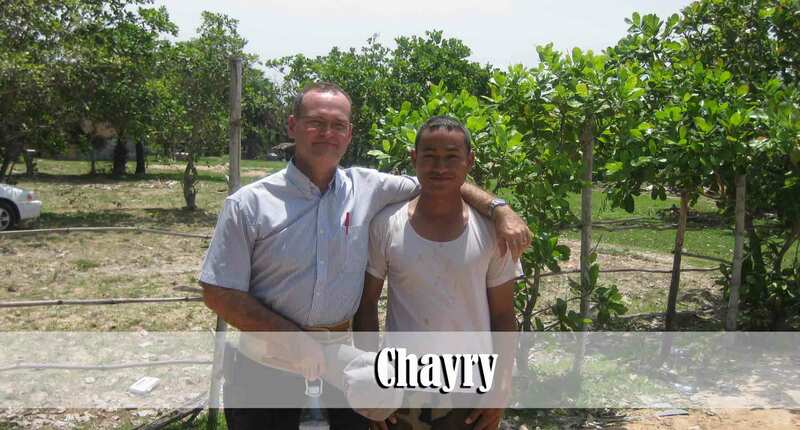 Pray that Chayry and Ge will continue to be faithful and that God will bless their new business. The persecution continues to this day for those who live in the village. Because of intimidation and threats by the local Muslim leaders, we lost nearly all of the children who were coming faithfully. Many of those children came to know the Lord but their parents are not saved. One of our Cham men told me this past week that as they interact with the children one-on-one in the village it is very evident that many of the children are truly saved. One blessing that has resulted because of the persecution is that we have seen just how strong the faith is of the Cham adults. We only lost one adult man. Rather than face the persecution he chose to leave the country and work in Malaysia. We trust that he, like John Mark in the New Testament, will one day return. Others have become emboldened through the persecution and it is very evident that the devil is not pleased with what is going on. Several of our key families in the village are presently undergoing serious health trials that we all believe are a direct result of the church going forward. The Lord is allowing their faith to be tested. The unsaved Cham community is taking advantage of the trials and using them as an opportunity to mock the believers and Jesus Christ, but the believers are standing strong. Even as I write this update Ra’s 14 year-old daughter, Ai, is in the hospital suffering from an aneurism. She was struck with this illness a week ago on the exact day that we began digging the footings for the new church building. Ra and his wife is among the most hated of the believers because of the fact that prior to salvation he was a leader in the Mosque. Ra, his wife, and two of their children are a fantastic testimony for the Lord. At the hospital this past weekend he shared with me how his own mother now hates him so much that she refuses to even look at him. Please pray for Ra and his family. Especially pray that God’s power will be manifested in a miraculous way and that Ai will be healed. Humanly speaking the prognosis is not a good one. Chayry’s village is about 7 kilometers from the Cham village. You will recall that the Cham church was forcefully driven out of the Cham village about 4 months ago. One of the blessings of having the church relocate to a different village is that the Gospel has now spread to people who have likely never heard a clear presentation of the plan of salvation. Just this past week our soul-winners in the village led an elderly lady to faith in Christ. Several children have accepted Christ in this new village as well. These folks have never had a Bible-preaching church in their village. There are 4-5 other families who appear to be good prospects as well. 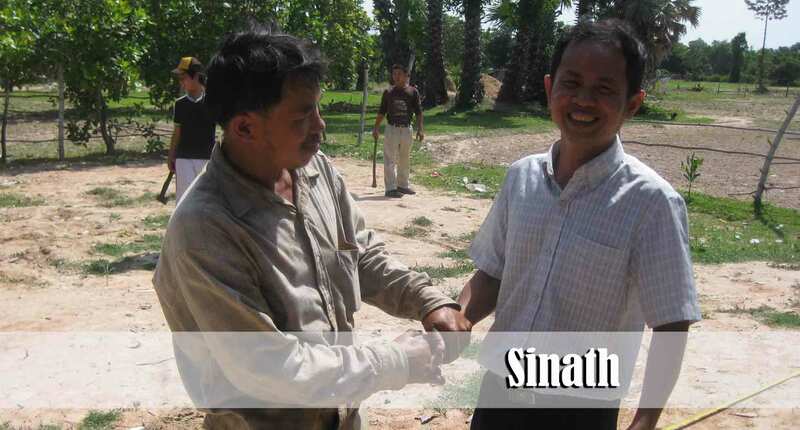 Please pray for the workers who are faithfully seeking to carry out the Great Commission in this new village. We are working on developing the music in the Phnom Penh church. Music is so important as it helps to set the spirit for the entire service. 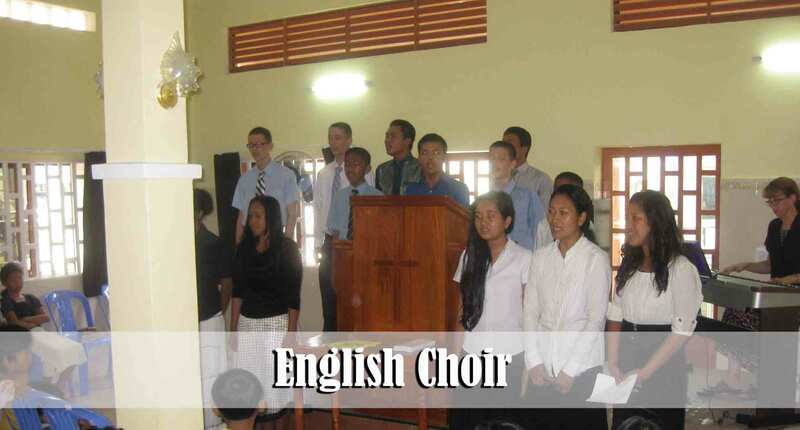 Several months ago Mrs. Keo started an English choir. They have sung a few times now and each time they sing it is a blessing. One of the needs that we have is to train musicians who can play for the various ministries that take place here at the church as well as in the various village ministries. In recent days 2-3 of the young folks have expressed interest in learning to play the piano. I just happen to be married to the best pianist in Cambodia ! 🙂 Debbie taught many students in the States and would love to teach some of our people as well. The challenge will be to fit the lessons into the schedule. That is something that we hope to work out in the days to come. We have still not been able to move the Phnom Penh children’s ministry back to Sundays. When we were meeting on Sunday we would very often have upwards of 200 children who would attend. Now that we are meeting on Saturdays the numbers have dropped down closer to 100. We are finding that it is MUCH easier to teach 100 children at this point than 200. The commitment level of many of these children has increased dramatically. Bro. 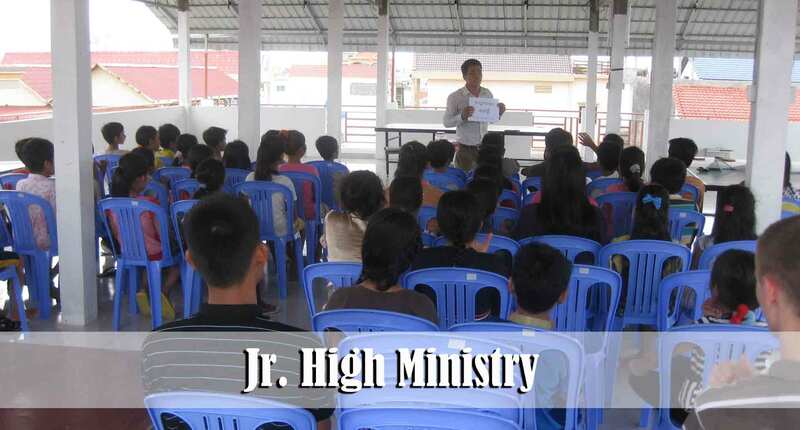 Vannak, whose class meets on the roof, is doing a wonderful job of preaching and teaching the Jr. High young people and we are seeing significant spiritual growth in several of them. These 4 young men are among those who are faithful to come on Sundays and Wednesdays as well. Veasna, the young man on the far left, has been a good testimony to his family at home. This past Saturday Bro. Keo spent an hour witnessing to his father. One comment that his father made is that he is so happy Veasna is attending our church. He said that he has a new son and he likes it. We believe that as the young people are faithful to the Lord we will see many of their parents come to know the Lord. Pray that our youth workers will have wisdom and enough energy to keep up with all the young people. Sopheak has been attending the church for almost a year now. She was always moody, unpredictable, and somewhat difficult to deal with. Then about 6 weeks ago she approached Kahnya after the morning service and told her that she wanted to get saved. 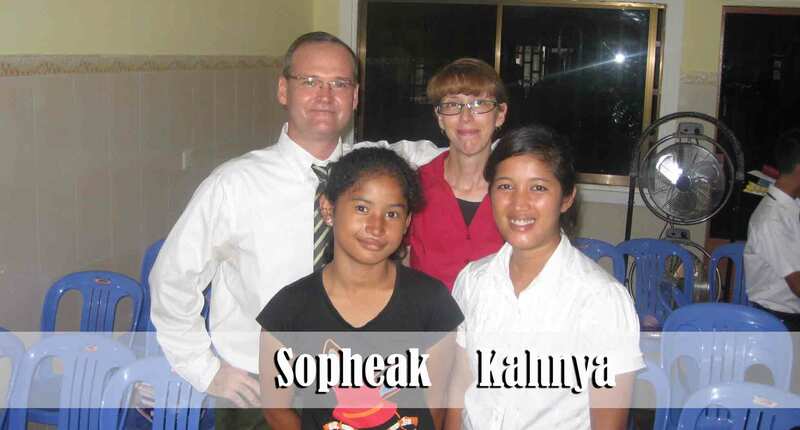 Kahnya dealt with her for awhile and Sopheak accepted Christ as her Saviour. She immediately asked if she could buy a Bible. It has been so amazing to see the change that has taken place in her life. She is now filled with joy and it is reflected on her face. In the past month Bro. Sinath and his wife, Sopheap, have become more serious in their commitment to the Lord. Since being saved about a year ago they have always been faithful to attend the services but it seems that God is now working their their lives in a special way. Sinath is faithful to Saturday soul-winning and Monday Bible Institute. A few weeks ago he began traveling back to his family’s village with Bro. Keo every Tuesday in order to witness to his extended family. As a self-employed tailor he takes a financial hit every time he misses a day of work. When our church was right across the street from his business, I would see him working from early in the morning until evening. Now it seems as though God is providing for his financial needs even though he is missing 2-3 days of work each week. He shared a testimony in our Sunday night service and admitted to the church that he believes the reason his extended family is not yet saved is because he has not been as committed to winning them as he should have been. He said that God has convicted him about this and he is committed to trying to win his family to Christ. Pray for Sinath and Sopheap to continue to trust God with their time, talent, and treasures. Also pray for his uncle, Grandpa Yin, who is the leader at the Buddhist temple in Sinath’s village. Yin has listened to the soul-winners for the past several weeks and we believe that he and his wife may be close to getting saved. Yin is over 70 years old. In the ministry here I always stress the importance of winning the lost in the community then inviting them to come to the church. We regularly meet folks in the community who profess to be saved and attend another church. However, it is somewhat rare to meet anyone who can give a clear testimony of salvation. Here in Cambodia there are many NGO’s (non-governmental organizations) that are here primarily to do social work, but many of them are involved in religious work as well (ie: World Concern, World Vision, Feed the Children, etc…). Based upon my experience it is my judgment that most of the “fruit” of the majority of these groups is short-lived and likely counterfeit. 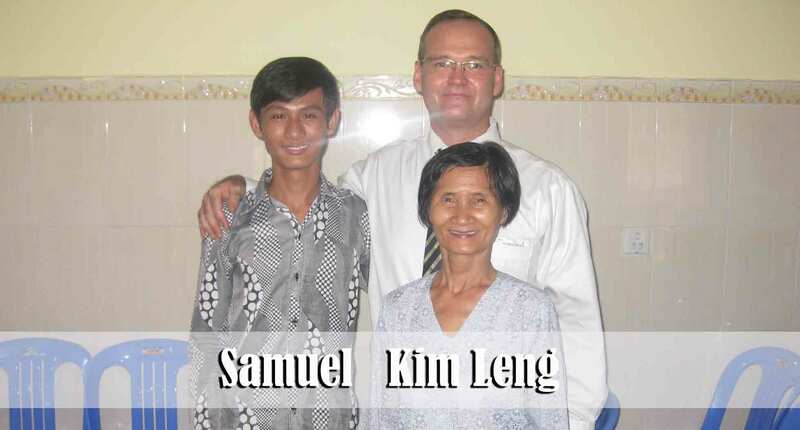 Samuel and his grandmother, Kim Leng, seem to be an exception to the rule. Two of our soul-winners, Ra and Man, met Kim Leng several weeks ago and invited her to church. It seems that she and her family were reached by one such NGO and then apparently abandoned. We are not totally clear on all the details. She has been faithfully attending the Sunday morning services for the past month. Yesterday her grandson, Samuel, attended as well. In fact they both came Sunday morning and Sunday evening. Samuel is only 18 years old but he seems to have a real heart for God. His father and mother are also believers but they live and work quite a distance away. Samuel has a younger brother who is named Isaiah. Sunday morning Samuel’s father came to Phnom Penh to meet with us. He requested that our church help mentor his sons and train them to better serve the Lord. We are excited about these new prospects and would ask you to pray that Samuel, Isaiah, and Kim Leng will continue to allow us all to have influence in their lives and that through their new relationship with our church they will become all that God desires for them to become. Pray for three new ministry opportunities that we hope to begin soon: 1) Outreach to an area called Stung MeanChey with the eventual goal of starting a local church. The particular area we will target is about 10 minutes from our church. 2) Outreach to an area called Toul Kork with the eventual goal of starting a local church. The particular area we look to target is about 20 minutes from the church. 3) I will begin doing one-on-one Discipleship with a young couple by the name of Sok Eng and Khema. This couple was not saved at our church but comes to us from a very large church that was started by Campus Crusade for Christ. This couple has been about 6 months deciding if God would have them become a part of our church. They have grown increasingly uncomfortable with the direction of their church in certain areas and they desire to be in a more conservative church. Sok Eng speaks fluent English. Khema is in her 4th year of medical school. Humanly speaking this couple comes to us with many talents and gifts that God can use for His purposes. Please pray that we will have wisdom to guide them and that I will discern God’s timing in allowing them to become involved in the ministries of our church. 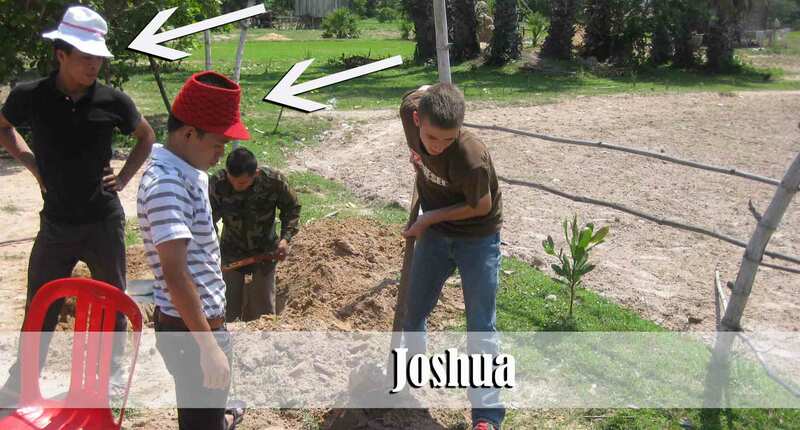 Josh refused to wear the “local” hats… He had a lot of sun burn the next day but said it was worth it ! Tremendous update! Always refreshing to hear of the wonderful things taking place in Cambodia. Our prayers are with you all and especially for the Cham people who have stood valiantly for our Lord! Thank you for the update Brother Board. Praying for you all and the great work and people that the Lord has called you to. It is wonderful to hear how God is blessing the work in Cambodia.